As the beginning of the 2013-2014 school year quickly approaches, students and parents must not only wrap up any last minute back to school shopping, but also prepare for transitions to a new grade, school building, or for some, a new school district. Fortunately, an exciting and informative video is currently being produced by a group of Brush HS students that will help make that transition easier to navigate. Produced under the direction of Mr. Michael Bubnow, the new production, titled Expectations, is hosted by Brush students Matt McLoughlin and sophomore Natalie Novakovic, with film and production assistance provided by senior Nick Hachem. Expectations provides an in-depth overview of the academic, behavioral and other important guidelines parents and students can expect at each grade level and school building during the 2013-2014 school year. This production helps to fulfill a major component of the district’s recently adopted strategic plan, to better prepare and inform the school community on the district. All three students spent the previous week filming segments of the series at each district school building, including an exciting final segment at Korb Field. In addition to being shown at each school building, parents and students will be able to view the exciting new video series on Channel 22 and local programming channels on AT&T U-Verse, as well as request a personal copy on DVD. Look for the video to be posted in the next few weeks! Be sure to check your local listings to find out exact air dates and times. 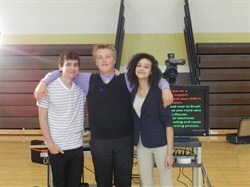 Congratulations to Nick, Natalie and Matt for their talented work and for helping to make Expectations a success!